Only a few men deserve the gratitude of German philately as much as Heinrich Koehler - as an expertiser, juror and auctioneer. Heinrich Koehler, born on 24 March 1881 in Darmstadt, was inspired, as a young man, with the possibility of becoming associated with both the narrower and wider worlds of the postage stamp. The son of the then celebrated opera baritone singer Bernhard Koehler, he went to Cologne to learn from the well-known stamp dealer August Drahn and occasionally to do business for him. He undertook study-visits to Italy, Great Britain and the USA, and also an adventurous expedition to Nicaragua, which at that time was hardly accessible, and where he was to take over the gold mines belonging to his uncle, but he finally returned to Europe for the sake of his wife Anna. Here in he founded, together with Louis Gilbert, the famous stamp firm of Gilbert & Koehler, in the Rue de Peletier in Paris (the portrait shown here dates from this year). On 1 - 4 June 1908 the first Gilbert & Koehler auction took place in Room 9 of the Hotel Drouot: the G. Koch collection was auctioned there. It was Wednesday 23 April 1913, at 2-30 pm: the festive hall of the House of Artists on the Bellevuestrasse in Berlin fills with people. Both the participants and the curious want to see the sensation of the day - the first general stamp auction in Germany. Koehler's close personal friends: Gaston Nehrlich, Lichtenstein, Weinberger and Oberländer. King George V, and King Carol II of Romania are illustrious guests and customers of the Heinrich Koehler auction house. And not without reason - most of the large collections of the day were auctioned by Heinrich Koehler. 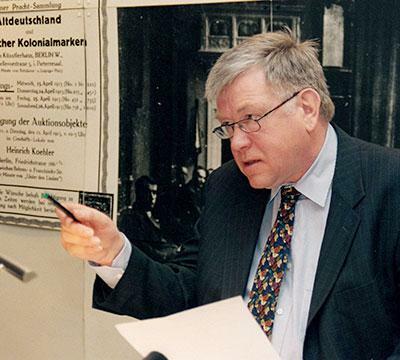 Heinrich Koehler achieved worldwide recognition and was a member of important international organisations, also the Expert Committee of the Royal Philatelic Society London (RPSL). He was also invited to sign the Roll of Distinguished Philatelists in England - being the second German, after Munk, to achieve this honour. The seizure of power by National Socialism meant an enormous drop in the activities of Heinrich Koehler - from now on the international public largely stayed away. Nevertheless, he was able to hold important auctions before the outbreak of war and also in the early years of the world war - but it was no longer his time. His death on 22 August 1945 was a huge loss for German and international philately. When he died, he and the philatelic world could look back on 116 auctions containing countless superb items. With the death of Heinrich Koehler an era of philately and philatelic auctions came to an end - though one would hardly like to mention this against the background of world events which overshadowed the evening of his life. 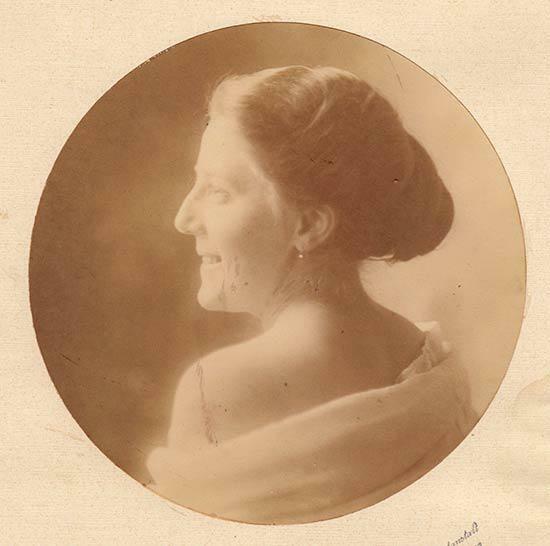 Heinrich Koehler's widow Anna, supported a little later by her daughter Henriette Grosse-Heinrich Koehler, nevertheless took over the tasks - in some respects difficult tasks - associated with their inheritance and decided to continue the Heinrich Koehler auction house. Berlin was destroyed. In 1948 the principal building at Friedrichstrasse 166 was requisitioned. Anna Koehler moved the company's headquarters to Wiesbaden, where there were family connections. Eventually, on 19 May 1949 they were finally able to hold the 124th Heinrich Koehler auction, the first at the Nassauer Hof in Wiesbaden. In doing so they began a new era for the auction house, continuing of a tradition whereby Germany stood for values very different from those which the country had embodied from 1933 to 1945. 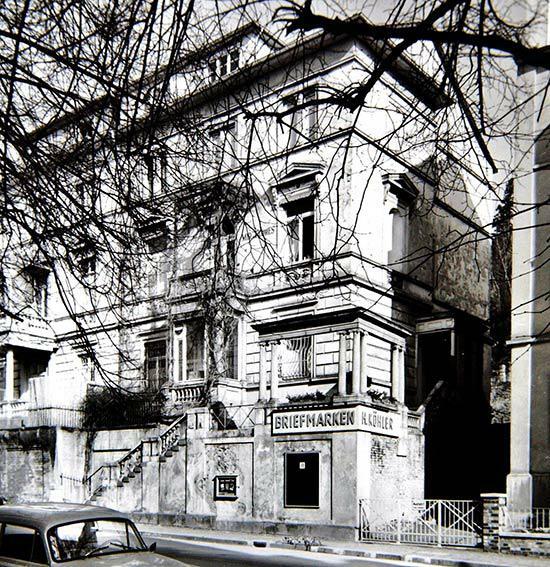 In 1970 Volker Parthen took over the Heinrich Koehler auction house as sole proprietor. From the outset Volker Parthen continued to lead the company in the same manner as its founder. With his extensive philatelic knowledge, an approach to marketing that was appropriate for the age, and the close contacts which he maintained over decades with the leading collectors of his time, he ensured that the firm of Heinrich Koehler was entrusted with the sale of many large collections. Among these were the "Danzig" of Bernard A. Henning, Chicago and "German Foreign Post Offices and Colonies" of Rolando Fuchs, Buenos Aires. With the "Old German States" of John R. Boker Jr., New York the Heinrich Koehler auction house under Parthen's leadership then attained a very special "high point" and could finally regard themselves as being back at the top of world philately. The ethnic German industrialist and investment consultant John R. Boker Jr. had, over four decades, aimed to acquire the "jewels" of Old German States philately. His philosophy was quite simple - to take from each issue of stamps of the pre-1870 German states the best existing piece - stamps in the best possible state of preservation, the largest blocks and the clearest postmarks. John R. Boker Jr. and Volker Parthen had known each other since 1972. When Boker entrusted his treasures to the house of Heinrich Koehler, Parthen reacted in the only correct way. He sold the unique and unrepeatable collection over a period of several years, in special sales which were dedicated exclusively to items from the John R. Boker collection. This avoided overloading the market during a short period. The success of the auctions exceeded all expectations. The first auction in Wiesbaden on 16 March 1985 brought the highest price which had ever been paid worldwide for a stamp. The cover with the legendary "Baden misprint" of 9 kreuzer black on green obtained a price of DM 2,300,000 (EUR 1,176,000). In 2002 with Dieter Michelson the house of Heinrich Koehler acquired at its head one the most internationally experienced professional philatelists of the younger generation. 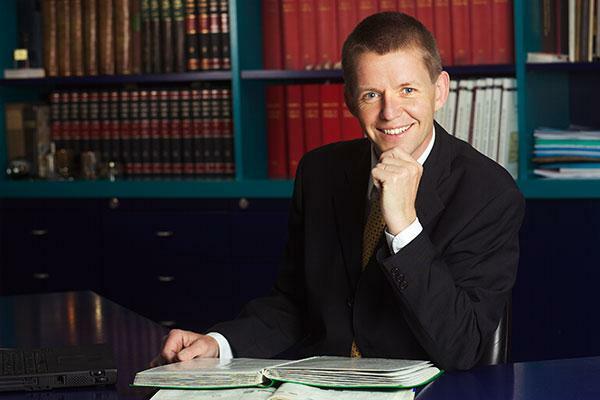 The oldest German stamp auction house was able to benefit immediately from the two decades of commercial experience, and the international connections which Dieter Michelson brought to the firm. Thus today a still broader range of interests and experience can be made available to sellers. At the same time, prospective customers and buyers can access an institution which has gained incomparable structure and content, which the firm can always offer in its variety and substance. Thus he does not regard it, for example, as a contradiction or betrayal of the "good old days" if philately enters the Internet age - a policy which under his guidance is pursued particularly energetically in regard to the online auction. Rather it is the consistent continuation of what the firm has pursued from its birth - bringing the international community together in the spirit of Heinrich Koehler. At the same time Dieter Michelson - as before him Heinrich Koehler and Volker Parthen - values and embodies the culture of the personal meeting and proximity to customers, business associates and philatelic partners. Therefore it is also perhaps no coincidence that directly under his guidance the exciting sale of the Simon Wiesenthal collection took place in 2006. Here, as is rarely the case with a collection, the "inner worth" - the great human gesture of reconciliation - towered above its outwardly apparent value. And the unexpectedly sensational results made it seem in a sense that the buyers were paying homage to the great personality of the collector - a kind of success completely appropriate to the house of Heinrich Koehler and Dieter Michelson.